Blue Wonder Communications is an independent design house and licenser of system solutions and IP supporting the 4G mobile standard 3GPP-LTE (Long-Term Evolution). The company’s name is taken from Dresden’s 19th-century Loschwitz Bridge; a technological marvel of its time. Blue Wonder Communications solves challenges from the antenna to the application, with special skills in mobile broadband-modem design, OFDM-based system development, and design of low-power semiconductors. 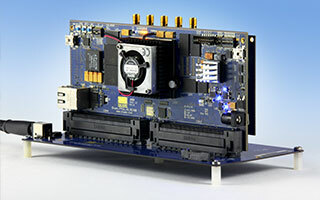 When developing system solutions such as the BWC200, which is an integration ready LTE subsystem consisting of a complete LTE physical layer including layer 1 software, Blue Wonder’s engineers use prototype hardware that typically contains high-value programmable FPGAs and processors connected to high-speed memories such as Flash, various generations of DDR chips, and SRAMs. Blue Wonder chose XJTAG. “It was the most efficient solution, and offered the best value”, explains Mario Riedel. XJTAG has features that speed up boundary scan test development, including ready-to-run scripts for testing memory devices and general connectivity. The high-level test description language, XJEase, also simplifies writing tests for non-JTAG components such as UARTs or Ethernet ICs. The tests are written at the device level, and so can be re-used even as other parts of the board are redesigned. “We have saved significant time by using XJTAG”, comments Mario Riedel. “For instance the online library of non-JTAG device tests greatly reduces the time we spend writing boundary scan tests.” He adds that the speed and convenience of XJTAG are particularly valuable when testing large systems that have many cards slotted into a backplane. Users are free to modify or adapt library tests to gain a head start for testing non-standard devices. Mario Riedel comments that the XJEase syntax is easy to understand, even without professional programming experience. XJTAG’s device-level approach also saves the user creating the JTAG test vectors for testing the device; engineers can test boards successfully without first having to study boundary scan in depth. Blue Wonder’s board-assembly partners are also gaining advantages by using XJTAG. Data fed back from the production-optimised XJRunner test system has helped adjust reflow settings to tune out avoidable manufacturing defects. We first chose XJTAG as the most efficient boundary scan test system offering the best value. We have saved significant time thanks to its built-in features, the XJEase programming language with easy to understand syntax, and the large library of non-JTAG device tests. This greatly reduces the time we spend writing boundary scan tests. Testing with XJTAG is now a mandatory step in our board bring-up procedure, and is able to pinpoint faults that other equipment, such as X-ray inspection, is unable to identify. Much of our testing is now based only on XJTAG. Do you wonder who is coming out of the blue? Blue Wonder Communications, headquartered in Dresden, Germany, is a startup striving to become the leading technology developer for fourth-generation cellular networks. In pursuing this goal, testing prototypes using XJTAG has become a mandatory step in the board bring-up procedure. Manufacturing partners are also using XJTAG in volume production.